In my previous post in the NOSD series, I mentioned how an improved forcefield diagram was needed to model the kind of reasoning I'm trying to bring in software design. I also discussed the artifact-run/time dualism, and how many concepts in language design were born out of the fundamental need to balance conflicting forces between these two worlds. I also mentioned the role of some patterns in resolving the same kind of conflict. Here I'll show you a practical example, introducing the improved forcefield notation as we go. It's quite simple, and as usual, the reasoning is more important than the drawing. I'll use new colors and shapes, but it's all very informal, the notation is not cast in stone, and it will probably evolve and change over time. You have two classes (Class1, Class2); as we learnt in Chapter 6, that usually means you have two artifacts, and right now I feel like blue is a good color for artifacts, so I'll color them in blue. Now, those classes have some commonality in behavior; for instance, they both represent a geometrical object, and can provide you with a bounding box. Behavior is a run-time concept, and I'll color that information in pink. Commonality in behavior is an attractive force; I haven't talked about this yet, but trust me : ), or just rely on your intuition that "things that do similar things are close to each other". Commonality in behavior also attracts a natural desire in the artifact space: polymorphic/uniform access to such behavior. While writing calling code, I'd like to ask for a bounding box in the same way, perhaps polymorphically through a base class / interface. That would make my client (partially) unaware of the specific classes. Note that there is nothing here about a solution. At this stage, the forcefield is a representation of the problem. Still, we have a conflict between forces, and somehow we have to deal with it. What if we don't? I'll keep that as last. A missing concept in my previous attempts at modeling the forcefield was the very important notion of decision. Although I'm trying to keep concepts to a bare minimum, the Decision Space is an important piece of the puzzle, and there can't be a Decision Space without Decisions. I'm using a yellow hexagon to represent a decision. So, decisions can alter the forcefield, for better or worse. Still, we may choose to keep the artifacts unchanged. Perhaps Class1 and Class2 come from third-party libraries, or perhaps they're shared with a lot of existing code, and refactoring may impact that code as well (remember Mass and Inertia). Again, it's useful to represent this decision explicitly, although it's just an intermediate step. I colored "Different Conventions" in green to say that we deliberately decided to keep it inside the forcefield. Design patterns are now mainstream, with dozens of books and hundreds, if not thousands, of papers describing the problem / context / solution triad. Now, the solution is usually represented using a UML diagram and/or some source code. Problem and context are described using text, or an example in UML/code. That's because we don't (didn't :-) have any proper way to describe a problem (forcefield) and context (mostly, pre-made decisions). 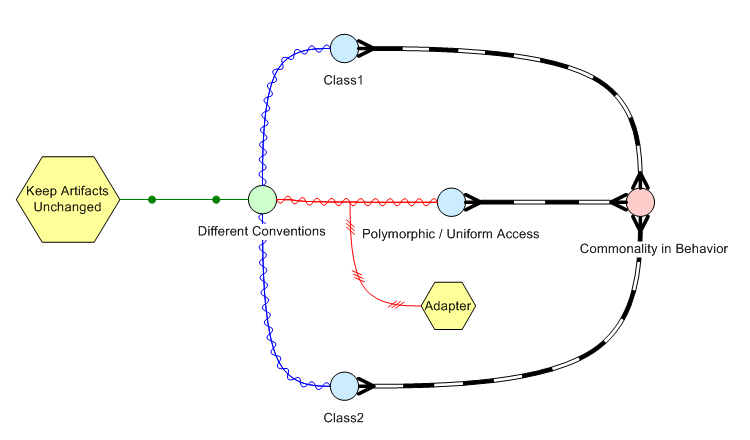 Adapter "simply" breaks the rejection between Different Conventions and Polymorphic / Uniform Access, therefore allowing client code to ignore the specific interface of Class1 and Class2. It is very interesting to observe what the forcefield is telling us: we didn't completely remove conflict. There is still an attraction/rejection between Class1 and Class2. In this sense, Adapter is less effective than refactoring (which, however, requires us to change the artifacts). That conflict will emerge over time; for instance, adding common functionality will take more time, possibly some duplication of code, etc. This kind of "consequence" is not very well documented in the GoF book. Note: there is no redundancy with code here: we're talking about the problem space and the decision space. Contrast this with the usual redundancy between a UML diagram and code (with pros and cons, as usual). Also, isn't this diagram much better at communicating design problems, decisions, and impact than the largely ignored design rationale tools and notations? There is also a different decision we can make; it's a particularly bad decision, therefore it's also very popular :-) wherever code quality is easily ignored. We can just forgo uniform access, and have clients deal with a non-uniform interface (through if, switch/case, whatever). This is what I meant by "not dealing with conflict" earlier. I called that decision "Tangled Clients" for reasons that will become clear in a future post. - Very simple: the adapter is extremely frequent in the real world as well, as the well-known socket adapter. The forcefield is remarkably similar, but finding the exact translation of every concept is not necessarily trivial. Try this out :-). - Harder, some engineering knowledge is required. Rotating pumps may leak (why? hint: some empty space is needed if you want something to rotate freely :-). Old pumps just used a seal, which wasn't really good at preventing leaks. At some point (I think around 1940) the end face mechanical seal has been adopted as a better seal for rotating pumps. However, the fluid can still leak, which ain't that good in a number of cases. An interesting solution here is the magnetic drive pump (look it up, guys :-). Draw the forcefield for the problem, and represent how using a magnetic field to transmit movement can compensate otherwise conflicting forces. By the way, this is the example I was thinking about when I wrote my previous post. - Manufacturing is actually full of great examples of conflicting forces and different approaches to compensate or overcome conflict. Think about thermal grease, just to give a starting point. The list is endless. Trying to model some forcefield in detail is a fascinating exercise. - If you want to stay on the software side, here is an interesting one. Take some programming language feature (for instance, if you use .NET, you may consider partial classes or attributes; if you use Java, annotations) and identify which tension between the run-time world and the artifact world they're meant to solve. Partial classes are a simple, but interesting exercise: most criticism I've heard about them is stemming from a very partial :-) understanding of the surrounding forcefield, just like the common abuse I've seen (split a large class in two files :-)). Back in my time, computer science students were introduced to the distinction between syntax and semantics from day one. That distinction is central in understanding programming languages from the algebraic perspective. When you are looking for a theory of software forces, however, you'll find another distinction more useful. We have artifacts, and we have run-time instances of artifacts. Software is encoded knowledge, and as software developers we shape that knowledge. However, we can't act on knowledge itself: we must go through a representation. Source files are a representation, UML diagrams are a representation, and so on. Source files represent information using a language-specific syntax; for instance, if you use Java or C#, you encode some procedural and structural knowledge about a class inside a text file. The text file is an artifact; it's not a run-time thing. Along the same lines, you can use UML and draw a class diagram, encoding structural knowledge about several classes. That's another artifact. Often, when we say "class C" or "function foo" what we mean is actually its representation inside an artifact (a sequence of LOCs in a source file, where we encode some knowledge in a specific language). Artifacts can be transformed into other artifacts: without mentioning MDA, you can just compile a bunch of source files and get an executable file. The executable file is just another artifact. At that point, however, you can actually run the artifact. Let's say that you get a new process: the process is a run-time instance of the executable file artifact. Of course, you may start several run-time instances of the same artifact. Once the process is started, a wonderful thing happens :-). Your structural and procedural knowledge, formerly represented through LOCs inside artifacts, is now executable as well. Functions can be called. Classes can be instantiated. A function call is a run-time instance of a function. An object is a run-time instance of a class. We never shape the run-time instances directly. We shape artifacts (like a class described through textual Java or C++) so as to influence the run-time shape of the instances. Sometimes we shape an artifact so that its run-time instances can shape other run-time instances (meta-object protocols, dynamically generated code, etc). Interestingly, some forces apply at the artifact level, while other forces apply at the instance level. If we don't get this straight, we end up with the usual confusion and useless debates. A few examples are probably needed. As I haven't introduced enough software forces so far, I'll base most of my examples on -ilities, because the same reasoning applies. Consider reusability: when we say that we want to reuse "a class" what we usually mean is that we want to reuse an artifact (a component, a source file). Reusing a run-time instance is a form of object caching, which might be useful, but is not what is meant by reusability. Consider efficiency: when we say "this function is more efficient" what we usually mean is that its run-time instances are faster than other comparable implementations. Consider mass and gravity (the only software property/force I've introduced so far). Both are about the artifacts. I guess it's all bread-and-butter so far, so why is this distinction important? In Chapter 1, I wrote: a Center is (in software) a locus of highly cohesive information. in order to create highly cohesive units, we must be able to separate things. so this is what software [design] is about: keeping some things near, some things distant. Now here is something interesting: in many cases, we want to keep the artifacts apart, but have the run-time instances connected. This need to balance asymmetrical forces in two worlds has been one of the dominant forces in the evolution of programming languages and paradigms, although nobody (as far as I know) has properly recognized its role. Jump on my time machine, and get back to the 70s. Now consider a sequence of lines, in some programming language, encoding some procedural knowledge. We want to reuse that procedural knowledge, so we extract the lines into a "reusable" function. Reusability of procedural knowledge requires physical separation between a caller and a (reusable) callee (that's basically why subroutines/procedures/functions had to be invented). So, we can informally think of reusability as a force in the artifact world, keeping things apart. Now consider the specular world of run-time instances. Calling a function entails a cost: we have to save the instruction pointer, pass parameters, change the IP, execute the function's body, restore the IP and probably do some cleanup (details depend on language and CPU). Reusability on the artifact side just compromised efficiency on the run-time side. In most cases, we can ignore the side-effect in the run-time world. Sometimes, we can't, so we have two conflicting forces. Enter the brave language designer: his job is to invent something to bring balance between these two forces, in two different worlds. His first invention is macro expansion through pre-processing (as in C or macro assemblers). C-style macros may solve the problem, but they bring in others. So the language designer gets a better idea: inline expansion of function calls. That works better. However is done, inlining is a way to keep things apart in the artifact world, and strictly together in the run-time world. 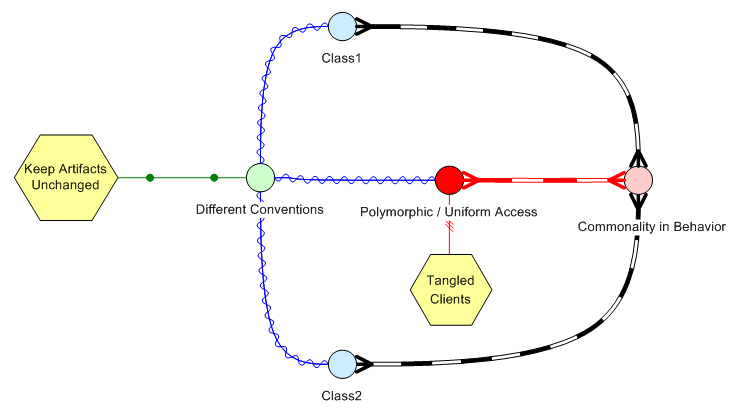 Move along time, and consider concepts like function pointers, functions as first-class objects, or polymorphism: again, they're all about keeping artifacts apart, but instances connected. I don't want the artifact defining function/class f to know about function/class g, but I definitely want this instance of f to call g. Indeed (as we'll explore later on) the entire concept of indirection is born out of this basic need: keep artifacts apart and instances connected. Consider AOP-like techniques: once again, they are about separating artifacts, while having the run-time behavior composed. Once you understand this simple need, you can look at several programming concepts and clearly see their role in balancing forces between the two worlds. Where languages didn't help, patterns did. More on this next time. At this point, however, we can draw another conclusion: that a better forcefield diagram would allow us to model forces (in the two worlds) and how we intend to balance those forces (which is how we intend to shape our software), and keep these two aspects apart. After all, we may have different strategies to balance forces out. More on this another time (soon enough, I hope). Interestingly, software is not alone in this need to balance forces of attraction and rejection. I'll explore this in my next post, together with a few more examples from the software world. I also have to investigate the relationship between the act of balancing forces and the decision space I've mentioned while talking about inertia. This is something I haven't had time to explore so far, so it's gonna take a little more time.